Hops are the flowers (also called seed cones or strobiles) of the hop plant Humulus lupulus.2 They are used primarily as a bittering, flavouring and stability agent in beer, to which they, beyond bitterness, impart floral, fruity or citrusy flavours and aroma;3 though they are also used for various purposes in other beverages and herbal medicine. The hop plant is a vigorous, climbing, herbaceous perennial, usually trained to grow up strings in a field called a hopfield, hop garden (nomenclature in the South of England), or hop yard (in the West Country and U.S.) when grown commercially. 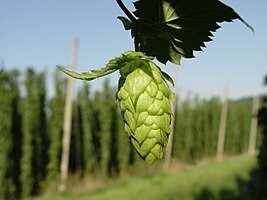 Many different varieties of hops are grown by farmers around the world, with different types used for particular styles of beer.